'Persian Cats' Exposes Repression Of Musicians In Iran No One Knows About Persian Cats tells the story of Iranian musicians trying to put together a band in a country where heavy metal, rock and hip-hop are illegal. The film won two prizes at last year's Cannes International Film Festival, and opens in this week in the U.S.
No One Knows About Persian Cats is about a band trying to find a place to make music in a country where popular music is banned. 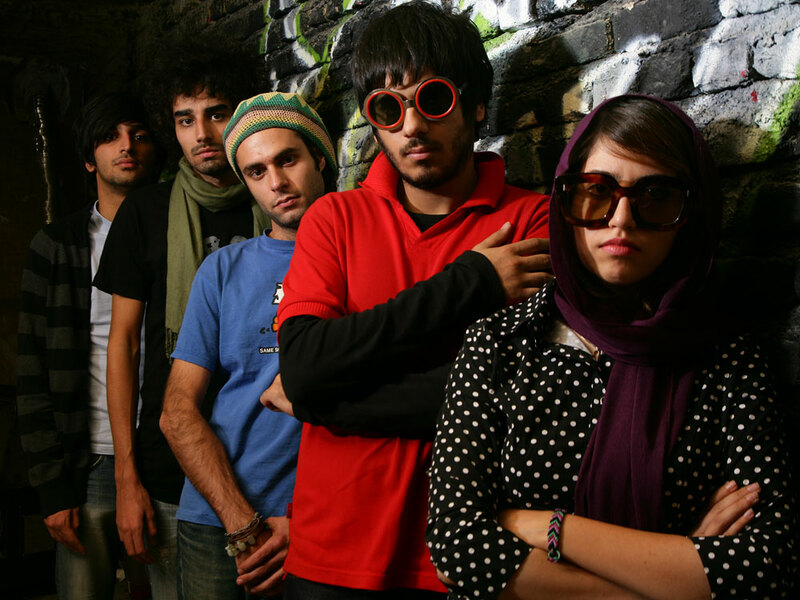 The new film No One Knows About Persian Cats tells the story of subversive musicians in Iran, where certain styles of music -- including heavy metal, rock and hip-hop -- are illegal to record, produce and consume. The film won two prizes at last year's Cannes International Film Festival and opens in the U.S. this week. The director is renowned Kurdish-Iranian filmmaker Bahman Ghobadi (A Time for Drunken Horses, Marooned in Iraq, Turtles Can Fly) and journalist and author Roxana Saberi is the co-writer, though much of the script was improvised. It was shot in secret, since popular music is banned in Iran. The movie takes place at real locations, as the musicians try to put together a band, a concert and a trip to England. But Ghobadi, speaking through an interpreter, emphasizes that it is not a documentary. "These kids have within themselves and their real lives a real drama," Ghobadi says. "It's not like in the West, going on freely and without any repression. They're being repressed -- they don't have any concerts, and this in itself makes them live a fiction life." Ghobadi's previous four films have dealt with the challenges of everyday life in Kurdish villages. But the young stars of No One Knows About Persian Cats, Ashkan Koshanejad and Negar Shaghaghi, are urban Iranians. Koshanejad says that they met Ghobadi in an illegal recording studio, and that the director and his writers wrote the film around them. "We had only 17 days to shoot the film," he says. "The reason for that is that we were invited to this festival, and we had to leave Iran. So Bahman decided to shoot right away in 17 days." Although there is humor in this quest to find a place, any place, to make music, singer-songwriter Shaghaghi says that humor was not the predominant feeling of her life in Iran. It was fear. "I was always so scared that there was a war that was going to happen, and that they were going to take us out of our houses," she says. "And then you go to school, and the fear that comes from the double life that you're living, one at home and one with the moral laws of school, what they're teaching you." No One Knows About Persian Cats conveys an appreciation of the everyday resilience of human endeavor. But Ghobadi says that's not what motivated him. "What I do in my films is that I vent," he says. "Because I have a lot of optimistic people around me while making the films, this rage becomes some positive energy and becomes reflected in my films." The director is blacklisted in Iran and lives as a nomad. He says that if he returns to Iran, he'll suffer the same fate as prominent film director Jafar Panahi, who was arrested last month for his opposition to the government. Ghobadi's friend and co-screenwriter, Saberi, was also imprisoned for four months last year. Ghobadi has managed to smuggle a DVD of No One Knows About Persian Cats into Iran. He is urging supporters to copy and distribute it for free, and tells people to spend their money on the musicians still living in Iran.